FLbutton — A FLTK widget opcode that creates a button. Notice that with FLbutton, it is not necessary to call the FLsetTextType opcode at all in order to use a symbol. In this case, it is sufficient to set a label starting with “@” followed by the proper formatting string. “#” forces square scaling rather than distortion to the widget's shape. [1-9] rotates by a multiple of 45 degrees. “6” does nothing, the others point in the direction of that key on a numeric keypad. ion -- value output when the button is checked. ioff -- value output when the button is unchecked. itype -- an integer number denoting the appearance of the widget. Buttons of type 2, 3, and 4 also output (kout argument) the value contained in the ion argument when checked, and that contained in ioff argument when unchecked. If the iopcode argument is set to a negative number, no instrument is activated. So this feature is optional. In order to activate an instrument, iopcode must be set to 0 or to 105 (the ascii code of character “i”, referring to the i score opcode). P-fields of the activated instrument are kp1 (instrument number), kp2 (action time), kp3 (duration) and so on with user p-fields. Notice that in dual state buttons (light button, check button and round button), the instrument is activated only when button state changes from unchecked to checked (not when passing from checked to unchecked). Here is an example of the FLbutton opcode. It uses the file FLbutton.csd, and beats.wav. Example 293. Example of the FLbutton opcode. 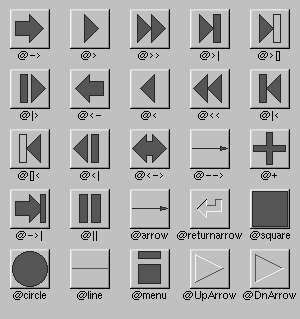 ; This example also makes use of a preset graphic for buttons.